Hard to put my finger on exactly why, but that made me feel really emotional. I suppose anything concerned with either Arthur Ransome or the Lake District tends to have that effect on me, but I think also the whole wonderful innocence of it all. Anyway, I’m looking forward to the book. When does it come out? And will you be using some of the those diary entries you’ve quoted on this website? You are so brave to admit that you were struck emotionally by the little film. I didn’t want to infringe copyright so we only used our private photos and footage but I must admit that I wept after seeing it again last night and I made it! We will bring out the book as soon as we can – I’ve used as many quotes as I can from my diary and Susan’s very amusing one. Suzanna’s. Her’s is mostly about food as one would hope and expect. Are you coming to the TARS AGM? It’s totally understandable that you should feel emotional. It must have been one the biggest moments of your childhood and such things enter your whole being at a very deep level at that age. As for the AGM, I hadn’t really thought about it. I must check when it is. As I mentioned in another post on this site I have a lot on at work right now as the nursing home I work for is moving to a new location so much stress! It would be fun to go and I really should so I’ll try to. By the way, may we call you Sophie when posting here? Sorry if that’s a bit of a cheek. This book you are writing, is it just going to be electronic or are you going to have it printed? We are hoping to have the book out in hardback (Hardcover), paperback and as an eBook. It will be wonderful on Kindle Fire as we can use the colour photos and the behind-the-scenes 6mm home movie footage that my father took, which is currently on you tube. Just excellent. Memories like those are worth more than anything. Well done to your mum for taking the cameras. I like your choice of front cover. Put me down for a copy of your book. I can’t wait. Your trailer really struck a chord with me. Swallows and Amazons had a big effect on my life, and this captures the depth of emotion I still feel. Thank you – I am waiting for the first proofs to arrive, which is exciting. These will have to be sent out all over the world for approval before we can publish but it’s all postive stuff – an adaptation of the Blog posts so many people have already read. Suzanna and I are being invited to give talks and attend screenings of the old film, which has it’s 40th birthday this spring. I turned up to one on Wednesday to find that most of the fans were my own age. The biggest laugh I’ve ever received was when I asked the audience if anyone had seen the film. There was a roar – ’20 times!’ they yelled. We’d all grown up with it. Gosh! How thrilling! Can’t wait! Is it really 40 years since I last went to the cinema? Good luck with all the copyright issues. 39 and counting. Richard Pilbrow started casting 40 years ago, but ti took a year to make. I was rather hoping someone else might sort out the copyright issues – but hopefully it will be a win-win situation. I am waiting for the first proofs. Hopefully I will be able to send you one soon! I think the makers of the new S&A will have quite a job. I doubt that they realise the tremendous affection that a couple of generations feel for ‘your’ film. Managing to attract the under-15s without alienating the mature audience by being ‘different’ will be very difficult, I fear. If the recent musical is anything to go by . . . . .
Sophie, this beautiful little video says so much. I felt drawn into it both spiritually and emotionally. Life, fun and adventure, strong familial bonds, unexpected friendships. The Lake District for me is one of the most beautiful places in England. Your filming of S&A evokes true Englishness (new word) of life as it was . I am so glad you like it. Please let me know if you have any qestions or suggestions. Yes, please call me Sophie. I think it was something about the editing that makes the short film work in an unexpected way. By the way, off topic, but the two videos you posted on YouTube from a Channel 4 program have been blocked in this country. Yes, thanks. It was written into my contract that I could show them on my Blog so I will sort that out tomorrow. The programe illusrates my first book ‘Funnily Enough’ in an obtuse way. No one believes that my mother is quite as I have protrayed her until they see for themselves. Sophie, perhaps you could play mother in the new film, similar to the railway children. Do you know when filming starts for S&A’s I would love to come and take some photo’s of the filming if that were possible. Oh, Roger – you will have to write to Nick Barton at Harbour Pictures and suggest that! Filming might start in June – or they may have to leave it until the end of August depending on a number of factors. I’ll try and post details. Did you like the little film we made from my mother’s photos and cine footage? It would be amazing if you could play mother. You would be brilliant. Thank you so much for the pleasure. You are kind. A number of people have suggested the same thing. I know that Nick Barton will need to try and get a BIG star for the part to help draw in finance for the film – but if you write to him at Harbour Pictures with the suggestion something just might happen. Just as the bird watching fraternity of twitchers flock to reports of rare birds, so I suspect that a whole army of Ransome fans will gather for the filming, armed with binoculars and tele-photo lenses and kept at bay by hastily erected fences! “There’re filming on Derwentwater today!” the word goes round the mobile phones. I have posted a letter to him today. I really hope you are considered. It would make perfect sense. You are kind. I would be very happy to play Mrs Dixon! I don’t know if Mrs Dixon appears in this film version but I always rather liked her farm, with the dairy and seed cake, peas and apples. I know how to hypnotise hens, which can be useful when filming. I am so glad you like the little film. It was Brian who encouraged my father to bring up his Bloex camera and shoot the home-movie footage we incorportated. 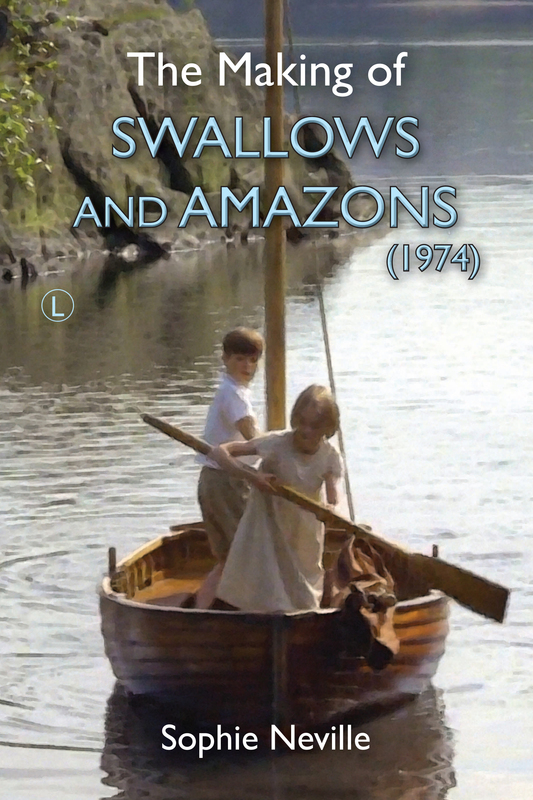 See if you can get tickets for the Dulwich Film showing of ‘Swallows & Amazons’ ~ To book email sarah@urquhart-briggs.com ~ letting her know about Brian and that you appeared in it! I will also admit to being very emotional, childhood memories, of being young etc….. Can’t wait for the book to come out. I have just read Funnily Enough which I loved. Watched Daphne the other night and I think her house fantastic – still breaking eggs on the floor for the otters.